How Will We Protect Our Homes From Rising Floodwaters? Most experts agree that extreme weather disasters like the Louisiana floods are going to be the new norm; according to the New York Times, the state has had eight “500 year” precipitation events (levels of rainfall that, based on past weather models, should only occur once every 500 years) in the past eight months. Climate change is no longer a distant future threat – it’s here. Even Zillow says so. 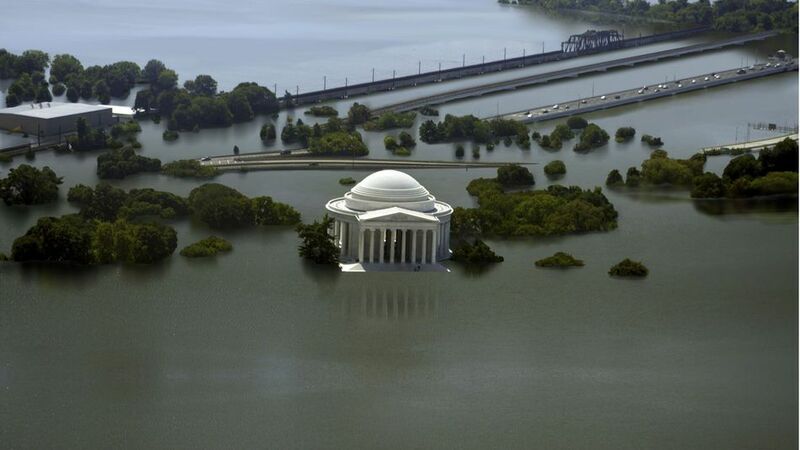 Flooding along waterways is probably going to happen every year (except in the places that become deserts), and sea levels are going to rise permanently; experts say a trillion dollars of real estate is going to be seriously threatened. The question now is, what can we do to prepare for it, other than moving to Canada and stocking up on canned goods? 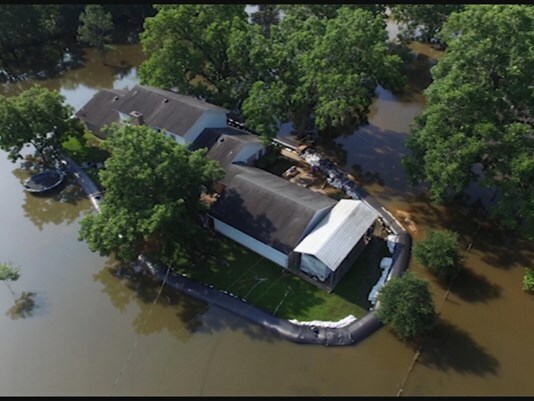 This past spring, a man in Houston named Randy Wagner surrounded his home with an “Aquadam,” a commercially available flood barrier made of thirty inch tall rubber tubing that, once installed, is filled with water. Wagner spent $8300 on four hundred feet of dam tubing, much to his neighbors’ amusement. Those same neighbors weren’t laughing when the Brazos River rose 2.5 feet after torrential rains in June, and everyone had to be evacuated in boats except for Wagner, whose house stayed completely dry through the catastrophic flood. For people who already own homes in places that are going to be untenable to live in very soon because of flooding *cough*Miami*cough*, this is a short-term solution. It’s very possible that in a few decades, they’re going to talk about buying Aquadam stock in 2016 like we talk about buying Apple stock in 1984. If there’s a bright spot in all this climate change gloom and doom, it’s that there have been people working on this very problem for literally centuries. Half of the Netherlands has been below sea level basically forever, so they’ve had a long time to devise strategies to deal with rising water; “Living with Water” is the urban planning agency’s motto. Their latest innovation are these floating houses. Built light, with a foundation of cement and foam, for now they sit on the river bottom in East Amsterdam, but as water levels rise (Dutch authorities estimate a five foot rise this century), the houses will gently bob upwards with the rising tide. (They’re not for the seasickness-prone, though, as even now they experience a slight bobbing motion.) They’re moored to huge posts by steel chains to they don’t float away, and their utilities and sewer pipes are routed through flexible plastic pipes that also float. What this means is that in the future, I could conceivably sneak out at night, cut the chains mooring my ex’s floating house in place, and let her float gently out to sea. Let’s get this done, people. 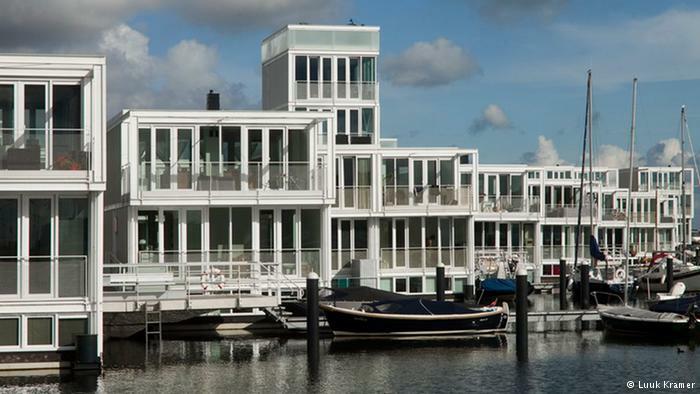 While the floating house is going to be the new standard for Dutch homes, for most of the 20th century, they just built houses with upper and lower sections: all the living areas were on the upper sections, and the lower sections were waterproofed and had huge doors on each side. When the waters rose, they’d just open the doors, and let the water flood harmlessly through. This “stilt house” design from architects at Newcastle University takes that idea to its logical conclusion. 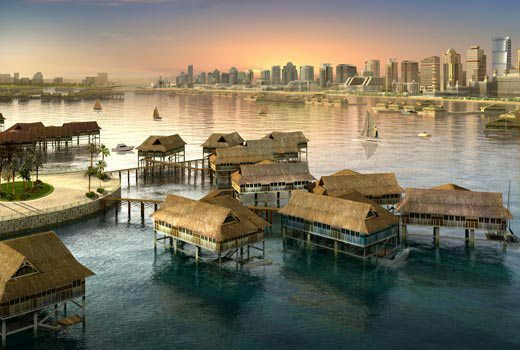 Already common in parts of Asia and Louisiana – where there’s an entire town on stilts – the scientists at Newcastle envision an entire network of interconnected stilt house “islands” towering above the floodwaters. Whereas the Aquadam is the “defiant” option of resisting the waters, and the floating house option is sort of cooperative/collaborative, this is the throwing-your-hands-in-the-air-and-giving-up option. I mean, if we start putting all our houses on stilts, it doesn’t really matter if ocean levels rise ten or even twenty feet, if we can just keep making the stilts taller. What this means is that with stilt houses, we can just keep using our aerosol deodorant and chugging around in our low MPG amphibious cars. This, then, is almost definitely going to be the most popular option for flood mitigation. ← Weird People in D.C.
Good one! you always have me cracking up but this one was pretty gut busting.